“to convert (as a body of information) from one system of communication into another; especially: to convert (a message) into code”. Now that we have the definition, are there devices mechanical or otherwise, allowing for encoding of information from one system of communication to another system of communication? A resounding YES! For our purposes, an encoder is an electromechanical device that converts information from one format or code to another, for the purposes of standardization, speed, secrecy, security or compressions. Encoders are sensors for monitoring position, angle and speed of moving mechanisms. There are applications requiring very precise placement of components relative to a datum or mating surface. Essentially, encoders can be categorized as rotary or linear. 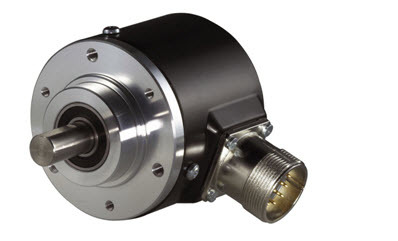 Rotary encoders are sub-divided into incremental and absolute encoders. There are many processes that require exact positioning of mechanisms, either linear or rotary. In some applications, such as remote surgery using robotic systems, position and angle are absolutely critical. Encoders provide this information to software and controllers. Linear encoders are sub-divided into wire draw and non-contact types. 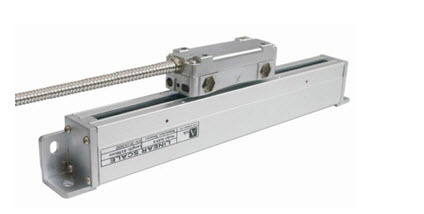 A linear encoder is for frictionless length measurement and determining position and is a sensor, transducer or reading-head linked to a scale that specifies position of a part relative to a datum point. The sensor reads the scale and converts position into an analog or digital signal that is transformed into a digital readout. Movement is determined from changes in position with time. Both optical and magnetic linear encoder types function using this type of method. However, it is their physical properties which make them different. The JPEGs below will indicate the “hardware” typically used relative to linear encoders. 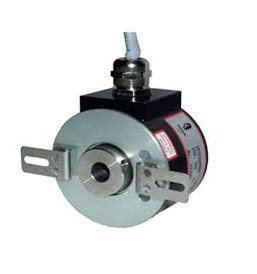 A rotary encoder also called a shaft encoder or magnetic encoder, converts angular position or motion of a shaft or axle to an analog or digital code. A rotary encoder consists of two parts: a rotor and a sensor. The rotor turns with the shaft and contains alternating evenly spaced north and south poles around its circumference. The sensor detects these small shifts in the position N>>S and S>>N. There many methods of detecting magnetic field changes, but the two primary types used in encoders are: Hall Effect and Magneto resistive. Hall Effect sensors work by detecting a change in voltage by magnetic deflection of electrons. Magneto resistive sensors detect a change in resistance caused by a magnetic field. This type of encoder would require a shaft coupling to operate. For this encoder, the shaft would be fitted into the opening shown and secured with key-seat or other fastening mechanism. In each case, electrical connections are necessary to send encoded data to a software package then to a controller mechanism. 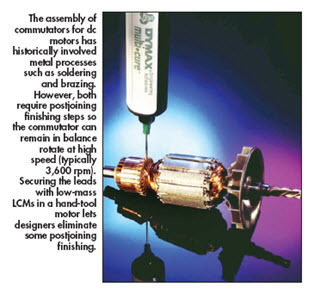 The mechanical world would be a very different place if it were not for linear and rotary encoders. Let’s take a look at real-life uses for both. I might note the disadvantages can be compensated for by applying appropriate shielding and components to the overall assembly. Sophisticated robotic systems use encoders in many places to ensure accuracy when the need to accurately position mechanisms is paramount. Users of equipment are usually oblivious to their presence. They work silently to perform predetermine tasks as dictated by software. The following post is taken from a training module written by this author and published through PDHonline.org. PDHonline is a web site offering continuing education units (CEUs) for professional engineers. At the present time, adhesive manufacturers offer products classified as Cyanoacrylates, Epoxies, Hot Melts, Silicones, Urethanes, Acrylics (one-part and two-part) and Light-cures. These classifications provide products with specific characteristics that allow for bonding, gasketing, potting and encapsulating, retaining, thread-locking and thread-sealing. This post provides information on one very specific and very special adhesive category— LIGHT-CURE. 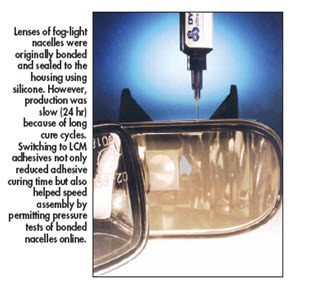 Light-cure adhesive technology offers a new approach to bonding similar or dissimilar substrates by using either ultraviolet light (UV) or light within the visible spectrum. Extremely rapid cure times, superior depth of cure, (up to four inches) and easy dispensability are only three of the benefits when using these adhesives combined with the appropriate processes. The newer visible light-cure materials can offer adhesion comparable to most commercially available UV adhesives, with particularly high adhesion on polycarbonate and polyvinylchloride (PVC) materials. All equate to lower cost of assembly, more freedom when designing components and products and the saving of valuable production time. This method of adhesion is extremely valuable when bonding thin films, needing heightened safety relative to skin and eyes and when bonding heat sensitive materials. This process can lessen, or eliminate, the need for costly and harmful chemicals from the workplace and can be solvent-free and non-hazardous. The use of light-cure adhesives will result in a very clean and “friendly” worker environment with no significant material disposal costs. There is no need to mix, prime or rush to apply the adhesive due to minimal time to dispense. Approximately forty (40) years ago, the adhesive industry introduced an acrylic-based adhesive that cured or solidified upon exposure to ultraviolet light. This was a tremendous breakthrough for the manufacturers and within a short period of time these adhesives became commercially available. This offered distinct advantages over traditional adhesives categories such as cyanoacrylates (CAs) and epoxies. Rapid cure times, adhesion to a variety of substrates and the ability to fill large gaps; i.e. 0.030 to 0.050 inches, were real winners with designers and assembly “shops”. It allowed for greater flexibility in design and assembly. Recent developments have produced adhesives that will cure using light within the visible spectrum. This offers great possibilities over adhesives previously requiring UV cure. These adhesives, UV/V (Ultraviolet/ Visible) were introduced in the 1990’s and involve employment of existing broadband-emitting UV light sources able to utilize an enlarged portion of the light spectrum. The mechanism by which this happens is the introduction of photo initiators that react exclusively with light in the visible wavelengths; i.e. those which exceed 425 nm. Development, as you might suspect, is still occurring and each year materials with improved mechanical characteristics and ease in application are being introduced into the commercial marketplace. The development of light-curing adhesives has been enhanced by the latest generation of curing equipment. 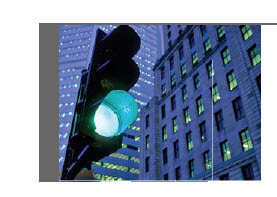 This equipment includes both flood and point source configurations using bulb or lamp based systems. In addition, equipment utilizing LED technology is now available for use with these adhesives. The benefit here is that LEDs generate focused wavelengths that create appreciably tighter output range relative to regular visible lamp technologies. Furthermore, because superfluous light and heat are not emitted, LED technology has proven to be both highly efficient and highly cost effective. As might be expected, as a result of their small size, LED curing systems provide an LED light source that is perfect for curing tiny component parts. The photographs and graphics below will give you an idea as to what types of products are now being produced using light-cure technology. Let us list now the relative advantages and disadvantages of using UV and V light-curing adhesives. 5.) When using UV light, the light source MUST reach the bond line if complete cure is to be had. This means that transmission of light through at least one substrate is crucial. Some substrates have UV inhibitors to lessen or eliminate degradation of the component. These inhibitors will inhibit the penetration and lessen adhesion necessitating another method of bonding. ( This is by far the biggest disadvantage for UV curing. ) A graphic depiction is given below that illustrates the principal. As you can see, there are very specific uses for light-cure adhesives and engineers and engineering managers would be well-served to explore the possibilities. I welcome your comments. Batteries are not included within the scope of RoHS. However, in Europe, batteries are under the European Commission’s 1991 Battery Directive (91/157/EEC), which was recently increased in scope and approved in the form of the new battery directive, version 2003/0282 COD, which will be official when submitted to and published in the EU’s Official Journal. While the first Battery Directive addressed possible trade barrier issues brought about by disparate European member states’ implementation, the new directive more explicitly highlights improving and protecting the environment from the negative effects of the waste contained in batteries. It also contains a program for more ambitious recycling of industrial, automotive, and consumer batteries, gradually increasing the rate of manufacturer-provided collection sites to 45% by 2016. It also sets limits of 5 ppm mercury and 20 ppm cadmium to batteries except those used in medical, emergency, or portable power-tool devices. Though not setting quantitative limits on quantities of lead, lead-acid, nickel, and nickel-cadmium in batteries, it cites a need to restrict these substances and provide for recycling up to 75% of batteries with these substances. There are also provisions for marking the batteries with symbols in regard to metal content and recycling collection information. It also does not apply to fixed industrial plant and tools. Compliance is the responsibility of the company that puts the product on the market, as defined in the Directive; components and sub-assemblies are not responsible for product compliance. Of course, given the fact that the regulation is applied at the homogeneous material level, data on substance concentrations needs to be transferred through the supply chain to the final producer. An IPC standard has recently been developed and published to facilitate this data exchange, IPC-1752.It is enabled through two PDF forms that are free to use. RoHS applies to these products in the EU whether made within the EU or imported. Certain exemptions apply, and these are updated on occasion by the EU. The RoHS 2 directive (2011/65/EU) is an evolution of the original directive and became law on 21 July 2011 and took effect 2 January 2013. It addresses the same substances as the original directive while improving regulatory conditions and legal clarity. It requires periodic reevaluations that facilitate gradual broadening of its requirements to cover additional electronic and electrical equipment, cables and spare parts. The CE logo now indicates compliance and RoHS 2 declaration of conformity is now detailed (see below). In 2012, a final report from the European Commission revealed that some EU Member States considered all toys under the scope of the primary RoHS Directive 2002/95/EC, irrespective of whether their primary or secondary functions were using electric currents or electromagnetic fields. From the implementation of RoHS 2 or RoHS Recast Directive 2011/65/EU on, all the concerned Member States will have to comply with the new regulation. The bottom line—it remains a complex world and global issues abound. These issues affect companies trying to market and sell their products to countries far and wide. We will not be successful unless we “play their game”. Maybe that’s as it should be. I welcome your comments. Several days ago one of my clients asked me to investigate the possible presence of conflict minerals used in the fabrication and assembly of products provided by them. I had heard the phrase but quite frankly had to school myself on the full meaning and possible ramifications if I found their presence to be incorporated in product or process on. Here is what I found. Let us first define conflict minerals and conflict resources. Conflict resources are natural resources extracted in conflict zones and sold to perpetuate fighting. The proceeds of the sale are used for the purchase of weapons, providing salary for members of the conflict groups and supplies needed to continue fighting. The most prominent contemporary example is the eastern provinces of the Democratic Republic of the Congo, where various armies, rebel groups, and outside actors have profited while contributing to violence and exploitation during wars within the region. The most commonly mined conflict minerals are cassiterite (for tin), wolframite (for tungsten), coltan (for tantalite), and gold ore, which are extracted from the Eastern Congo, and passed through a variety of intermediaries before being purchased by multinational electronics companies. These minerals are essential in the manufacture of a variety of devices, including consumer electronics such as mobile phones, laptops, and MP3 players,filaments for electric lamps, electron and television tubes, electrical contact points for automobile distributors, heating elements for electrical furnaces, and space, missile, and high-temperature applications. I’m sure we are all familiar with gold but the other three (3) minerals need some explanation. Cassiterite, is a heavy, brown-to-black mineral, tin oxide, SnO2, crystallizing in the tetragonal system. It is found as short prismatic crystals and as irregular masses, usually in veins and replacement deposits associated with granites. Since it is hard, heavy, and resistant to weathering, it often concentrates in alluvial deposits derived from cassiterite-bearing rocks. It is the principal ore of tin and is mined in many countries; the most important sources are Malaysia, Thailand, China, Indonesia, Bolivia, and Russia. Except for Bolivia, nearly all of this production is from alluvial deposits. The mineral, Wolframite, is a principal ore of tungsten. It is an iron and manganese tungstate mineral. Tungsten carbide is an important compound in the metalworking, mining, and petroleum industries. Alloys such as high-speed steel, cristite, and stellite, used in high-speed tools, contain tungsten. Other important tungsten compounds are calcium and magnesium tungstates, which are used in fluorescent lighting, and tungsten disulfide, which is used as a high-temperature lubricant at temperatures up to 500 deg C. Tungsten compounds also find uses in the chemical, paint, and tanning industries. The industry term columbo-tantalite has been shortened to “coltan” in central Africa. Tantalite is a black, heavy mineral not prized by collectors and little known outside high-technology circles. But since 2000, short-lived spikes in the price of this “black gold” have sparked environmentally damaging mining rushes in central Africa. These disruptive events have caused concern around the world. Tantalite yields the metal tantalum, whose strength, chemistry and electronic properties make it valuable in many high-tech and medical applications. Tantalum makes great capacitors for premium electronics, including cellular telephones and laptop computers. So the enormous worldwide demand for consumer electronics has put a strain on the supply of tantalite ore. Prices have occasionally soared to hundreds of dollars per kilogram. Central Africa is so desperately poor that thousands of men have rushed to the jungle to mine coltan this way. Prostitution, price-gouging and other disruptions went with them; moreover, the various armies in this war-torn region, both official and amateur, have moved in to take over the trade. Miners invade pristine forests, including the national parks. Besides destroying the land, they shoot the local wildlife—gorillas, okapis and other rare species—for food. Gold is the biggest source of conflict mineral trade in Congo and is most responsible for the ongoing bloody conflicts. Gold has soared in price on the commodity markets in recent years, and Congo is literally sitting on a gold-mine worth tens if not hundreds of billions of dollars. Despite promises by President Kabila to clean up the mining industry, corruption remains rife and thousands of small-scale unofficial mines scatter the country. We might add another mineral to the list: diamonds or “blood diamonds”. Some diamonds have helped fund devastating civil wars in Africa, destroying the lives of millions. Profits from the trade in conflict diamonds, worth billions of dollars, were used by warlords and rebels to buy arms during the devastating wars in Angola, the Democratic Republic of Congo (DRC) and Sierra Leone. Wars that have cost an estimated 3.7 million lives. You can now see why these minerals have been designated “conflict minerals”. Our federal government has entered the fray with the Dodd-Frank Act. Assess: Evaluate the design, implementation or operation of an organization’s conflict minerals program against the requirements of Dodd-Frank 1502, OECD frameworks and leading practices. Program planning: Jump-start conflict minerals compliance by scoping program requirements and defining a roadmap with details such as key steps, resource requirements, and timing. Design & build: Perform detailed design and development of a company’s conflict minerals program. A pilot program may be used as part of this stage to refine approach. Implement & operate: Implement and operate the conflict minerals program, including management and administration of the supplier reasonable country of origin inquiry (RCOI) and due diligence processes (with appropriate management oversight). Audit: Provide an independent performance audit or attestation audit over the design and execution of the conflict minerals due diligence, either for an SEC registrant or for other organizations to provide to their customers. To aid manufacturers and suppliers in this effort, a template has been structured to list and categorize any use and percentage of use for conflict minerals. The Electronic Industry Citizenship Coalition & the Global e-Sustainability Initiative have produced an Excel-based Reporting Template that helps companies collect information related to conflict minerals. Revision two of the template allows for more detail reporting on the product level and contains a list of known smelters around the world. These templates are the most common way to share information, but may require extra effort to gather the information from your suppliers about the origin of the conflict minerals used in your products. You may find copies of this template on line. Its use is very straightforward and fairly simple to use. This is one issue I am having right now with fulfilling the request from my client. Where do you get the information? I welcome your comments and certainly hope this information is helpful to you. The following facts were taken from “WaterAid.org”; and “Conservation.org”. You remember this one from your high school days. The Rhyme of the Ancient Mariner is the longest major poem by the English poet Samuel Taylor Coleridge, written in 1797–98 and published in 1798 in his first edition of Lyrical Ballads. Along with other poems in Lyrical Ballads, it was a signal shift to modern poetry and the beginning of British Romantic literature. In the mariner’s case, the water was there but undrinkable. What if you lived in an area where water was not there or you had to journey hours each day to fetch it? This is the way millions of people live on a daily basis. In some parts of our world water is in remarkably short supply. I have said in one or two previous posts that I believe future wars will be fought over water and not necessarily oil, gold, silver, the grab for power, territory, etc. (Of course I have been laughed at for saying this.) The human body needs food and water to survive. A human can go for more than three weeks without food. Mahatma Gandhi survived twenty-one (21) daysof complete starvation, but water is a different story. At least 60% of the adult body is made of water and every living cell in the body needs it to keep functioning.Water acts as a lubricant for our joints, regulates our body temperature through sweating and respiration, and helps to flush waste. The maximum time an individual can go without water seems to be a week — an estimate that would certainly be shorter in difficult conditions, like broiling heat. Water scarcity already affects every continent and is both a natural and a human-made phenomenon. There exists enough freshwater on the planet for seven billion (7) people, but it is distributed unevenly and too much of it is wasted, polluted and unsustainably managed. The term water scarcity is defined as the point at which the aggregate impact of all users impinges on the supply or quality of water under prevailing institutional arrangements to the extent that the demand by all sectors, including the environment, cannot be satisfied fully. It is a relative concept and can occur at any level of supply or demand. Scarcity may be a social construct (a product of affluence, expectations and customary behavior) or the consequence of altered supply patterns – stemming from climate change, for example. Around 1.2 billionpeople, or almost one-fifth of the world’s population, live in areas of physical scarcity, and 500 million people are approaching this situation. Another 1.6 billion people, or almost one -quarter of the world’s population, face economic water shortage. This is where countries lack the necessary infrastructure to take water from rivers and aquifers. Water scarcity is among the main problems faced by many societies and the World in the twenty-first century due to usage growing at more than twice the rate of population increase in the last century alone. Although right now there is no global water scarcity as such, an increasing number of regions are chronically short of water. By 2025, 1.8 billion people will be living in countries or regions with absolute water scarcity, and two-thirds of the world’s population could be living under water-stressed conditions. Sub-Saharan Africa has the largest number of water-stressed countries of any region. Water covers 70% of our planet, and it is easy to think that it will always be plentiful. However, freshwater—the stuff we drink, bathe in, irrigate our farm fields with—is incredibly rare. Only 3% of the world’s water is fresh water, and two-thirds of that is tucked away in frozen glaciers or otherwise unavailable for our use. Groundwater is the water stored deep beneath the Earth’s surface in underground aquifers. Another 68.6% of all freshwater is stored in glaciers and polar caps. That leaves only 1.3% of the total freshwater on Earth in surface water sources such as lakes, rivers, and streams. But it is surface water humans and other species rely upon for their biological needs. Around the world, 768 million people don’t have access to safe water, and every day 1,400 children under the age of five die from water-based diseases. Achieving universal access to safe water and sanitation would save 2.5 million lives every year. Over 500,000 children die every year from diarrhea caused by unsafe water and poor sanitation – that’s more than 1,400 children a day. Diarrhea is the third biggest killer of children under five years old in Sub-Saharan Africa. Every year, around 60 million children are born into homes without access to sanitation. (Hutton, Global costs and benefits of drinking-water supply and sanitation interventions to reach the MDG target and universal coverage, WHO, Geneva). What if something could be done about the water shortage? Something dramatic that would lessen the burden for millions of people in countries where water is a huge problem. 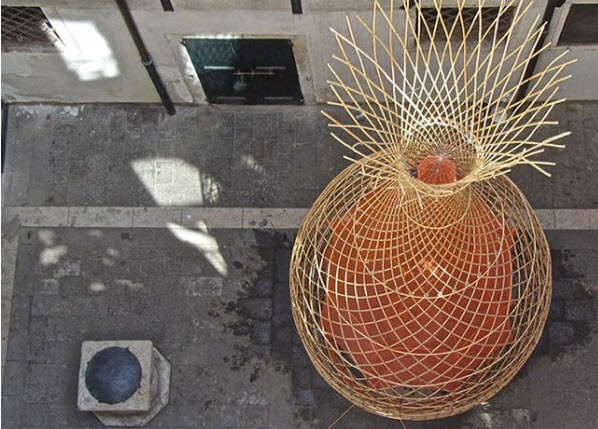 Designer Arturo Vittori believes the solution to this catastrophe lies not in high technology, but in sculptures that look like giant-sized objects from a furniture catalogue. 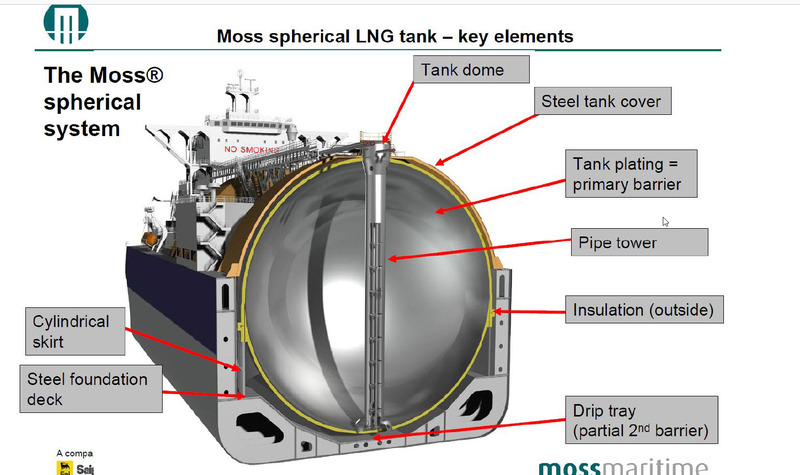 The graphic below will show the overall design of his “water tower”. As you will see, it’s striking. These two towers are installed and working AND producing water from atmospheric moisture. The marvelous thing to me is the accumulation of water in the most arid climates. His stunning water towers stand nearly thirty (30) feet tall and can collect over 25 gallons of potable water per day by harvesting atmospheric water vapor. The collection devices are called WarkaWater towers. 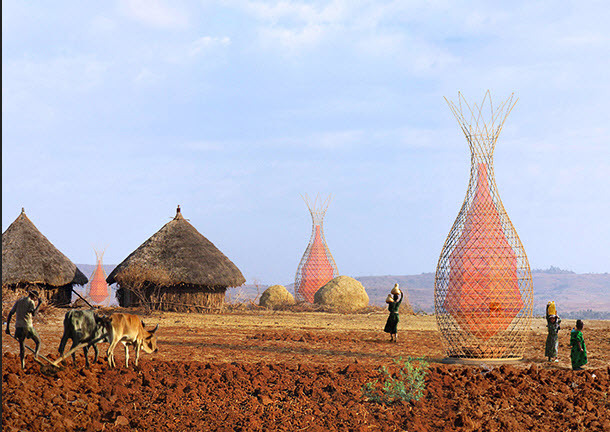 These WarkaWater Towers were inspired by the local Warka tree, a large fig tree native to Ethiopia that is commonly used as a community gathering space. 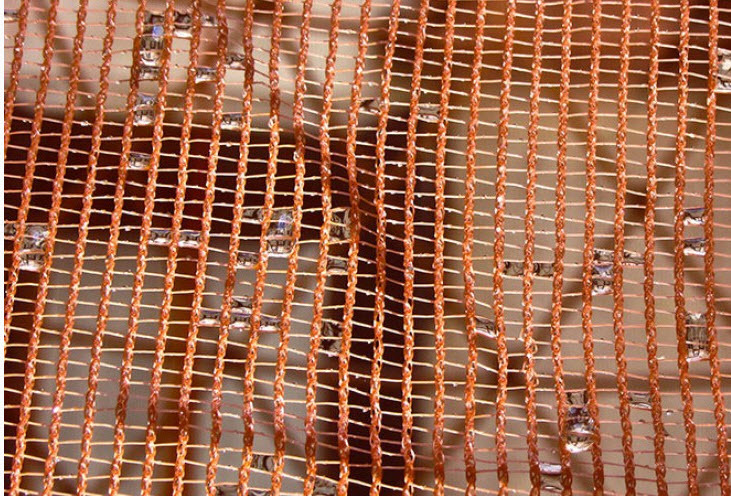 Located inside is the plastic mesh material made from fibers that act as micro tunnels for daily condensation. As droplets form, they flow along the mesh pattern into the basin at the base of the towers. By harvesting atmospheric water vapor in this way, it’s estimated that at least 25 gallons of potable water can be sustainably and hygienically collected by the towers every day. “WarkaWater is designed to provide clean water as well as ensure long-term environmental, financial and social sustainability,” he says. 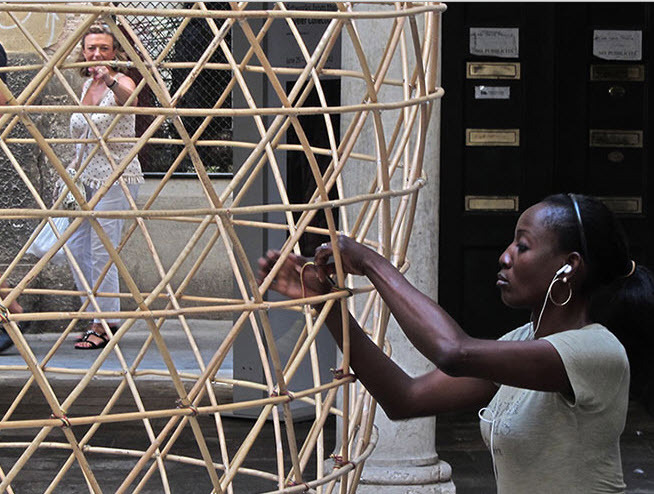 “Once locals have the necessary know how, they will be able to teach other villages and communities to build the WarkaWater towers.” Each tower costs approximately $550 and can be built in under a week with a four person team and locally available materials. The JPEG below shows a lady lacing the exoskeleton of an individual tower. Please note the amazement of the lady looking at the tower and the work the assembly person is accomplishing. This is the top view of the tower. I feel it is not only utilitarian but definitely a work of art. Obviously, remarkably functional and capable, under the right circumstances, of saving lives on a daily basis, not to mention lessening serious disease.